The acquisition of concepts in art history is an understudied and frequently ignored topic. Most students are first exposed to art historical concepts in college as high schools are faced with budget cuts and/or a lack of interest ignore the arts and few if any focus on art history. This puts the beginning art history student at a disadvantage as he or she lacks the high school or grammar school foundations upon which to expand his or her knowledge of art. A collegiate art history instructor faces many challenges in presenting new topics and making the course material accessible and meaningful for students of varying backgrounds. 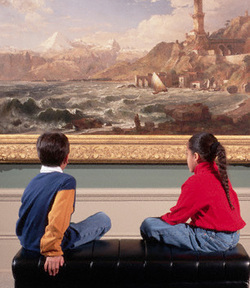 Retention of key concepts and the translation of these concepts into other disciplines are equally important; many introductory art history courses are taught to non-art majors who have enrolled in the course to fill a required elective; making the class a meaningful, engaging, and dynamic experience for all students is of paramount importance. Laura H. Chapman, author of the book Instant Art Instant Culture: The Unspoken Policy for American Schools, expounds upon McCarthy’s sentiments, noting how “introductory art history courses may be taken in large, impersonal lecture halls and require little beyond learning the names of artists, titles of works, dates, stylistic labels, and one or two distinguishing characteristics of a work.”3 Nicknamed “art in the dark,” the opposition to this traditional method of instruction is echoed by numerous authors and instructors. Through this accepted instructional method, passing grades are given to students who can successfully recite names, dates, and titles on exams. A familiar sight for students of art history. Surely there is a better approach to the study of art history; one that will engage students in an active learning process that generates skills applicable across disciplines. As Peter Bacon Hales, Professor of Art History at the University of Illinois at Chicago notes in the article “Discipline/Survey,” “other disciplines in the American system of higher education rarely if ever propose to present the sum of accumulated knowledge in a coherent, ideally seamless, chronological journey lasting exactly two semesters and traveling from the beginning of human history to the immediate present.”8 It is entirely possible, and has been vigorously suggested, that the very nature of art history and the breadth of knowledge art history courses propose to teach may be intimidating for instructors. The onus for enlivening art history courses at the college level is evenly distributed across primary, secondary, and collegiate classrooms. In the article “Does Art History Go to School?” Lynn Galbraith and Marvin Spomer, both of the Department of Art, Curriculum, and Instruction at the University of Nebraska, note three main factors influencing the teaching (or lack thereof) of art history across grade levels. The first factor involves “curriculum guidelines, inappropriateness for their grade levels, lack of class time, scheduling arrangements, inadequate funding, and poor support from school administrators as deterrents to teaching art history as part of a more formal and organized approach. "9 Unfortunately, the arts are afforded little importance. In Art in the Humanities, author Patrick DeLong notes how “in many instances, parents and traditionalists in education think of art as a frill subject rather than a vital part of human living. "10 A poor attitude toward the arts is cultivated and perpetuated from administrator to parent to student. Even when high schools offer art programs “the student who is college-bound will not be encouraged to take art electives. Art has so little intellectual respectability that many colleges and universities will not count high school art electives toward admission. "11 To expect that such an attitude would not manifest itself in a classroom is a naïve assumption. but also knowing that they would not be responsible for teaching such content when they finally entered teaching. A typical lecture in an art history survey course. McCarthy clearly approaches the subject of art history as an expert. He has “suffered through” lecture classes and large seminars, memorized slides and passed courses. He has gone beyond the introductory stage of art history to a point where now he is able to apply his knowledge in a meaningful and pertinent way. It is important to note, however, that most students enrolled in an art history survey course will never progress beyond the introductory stage. For these students art history is an elective that fulfills a graduation requirement, not a vocation that will allow them to use the knowledge they acquire. To this end, the “deep distaste” to which McCarthy speaks is very easy to explain; students are being taught to memorize facts and dates that will have no bearing on their future endeavors and they approach the subject with an appropriate amount of enthusiasm. Art history, theory, and appreciation courses are most often held in contempt for the way the material is presented. The long-standing lecture method frequently comes under fire as illustrated by John Stinespring and Brian Steele, faculty members in the Department of Art at Texas Tech University, in their article “Teaching Art History: Getting Started.” They note how the lecture method “has long ago been shown to produce poor results in retention of information and motivation, especially below the college level. Furthermore, lecture tends to make a teacher do all the work while the passive (and often bored and inattentive) students’ brains remain idle. "17 Surely there exists a more effective way to present art historical material. Instructors need to reexamine current teaching methods and revise those approaches that do not actively engage students in the learning process. A critical review of the current and accepted literature on art history education reveals some revisionist approaches. One approach focuses on the very nature of art historical study and scholarship while representing an area of contention amongst art historians. The issue, spurred on by a growing momentum to question which works should be included in an art historical survey, centers on the debate of “whose” art history to teach. The standard survey course and its accompanying texts feature a chronological study of works by the “great European masters.” In the article “The Future of Art History and the Undoing of the Survey,” Associate Professor of Art History at Auburn University Mark Miller Graham accurately summarizes the current state of the survey; “the discipline of art history has defined the survey in practice as a chronological introduction to the art of the West, centered on the great narratives of high cultures. "18 Given a diverse classroom population it is only fitting that the art history survey adopts a more multicultural approach to instruction. Graeme Chalmers, Associate Professor of Education at the University of British Columbia and author of “Teaching and Studying Art History: Some Anthropological and Sociological Considerations” states that “when we see what our students in the schools know as art, i.e., the popular arts and the arts of their own ethnic groups, the [current approach] just does not make sense. "19 A broader approach would allow students to form their own art historical context that includes their heritage, their peers, and themselves as part of the art historical process. Excluding artworks from a canonical survey gives the impression that these works are inferior and therefore not worthy of study. The same holds true for the types of artwork included; Janson speaks to the necessity of “a more integrative approach to the art of the past, embracing not only the traditional ‘major arts’ of architecture, sculpture, and painting, but the whole range of ‘minor’ or applied arts” including photography, ceramics, metalworking, costuming, film, and commercial arts.20 A survey of basic student knowledge would reveal a vast knowledge and understanding of commercials, cinema, videogames, and a host of other “modern” media. Kerry Freedman, instructor of Art Education at the University of Minnesota and author of the article “Recent Theoretical Shifts in the Field of Art History and Some Classroom Applications” stresses the “importance of considering popular culture and contemporary art as part of the field of art history. "21 She goes on to state that “by analyzing similarities and differences between the objects and images under study and those they encounter in museums, people’s homes, books, television, and other mass media, students can be helped to see the complexities of art. "22 The inclusion of modern forms of visual expression not only engages students but also creates a collaborative learning environment in which the student becomes the expert. Instructors can tap into a student’s knowledge by including elements of popular culture and utilizing this knowledge as a segue way to or source of comparison for older, less familiar works. Instructors who are aware of their students’ knowledge, skills, attitudes, and preconceptions about the discipline utilize a learner-centered approach to art history. If these instructors were to fully assess what their students know not only about art history but also in general, they would undoubtedly discover a large gap in vocabulary, terminology, and even literacy. Many courses jump into full-blown discussions of style, composition, and layout. Knowing how the arts are neglected within the K-12 curriculum, it is unrealistic to expect that a college student would understand these concepts. Chapman notes, unfortunately, that “even at the college level, faculty who teach art appreciation courses often must begin with concepts that could have been introduced in the fifth, sixth, or seventh grade. "23 Given students’ lack of foundational concepts, it may be wise to spend less time focusing on art historical data and more time on teaching students to write, speak, and evaluate the artistic experience. “Students need experience in talking and writing about art if… they are to respond intelligently and critically to the images they encounter. "24 This statement speaks to the importance of a broad, foundational approach to an introductory survey course in which students are encouraged to write and talk about art; critical skills that are applicable across disciplines. Should art historical concepts be introduced at an early age? Do nontraditional works have a place in the classroom? At first glance, a critical review of the available literature on art history seems scant. Many art education texts include chapters on art history or mention it in passing as a way to supplement art production, but few if any are devoted solely to the issues of teaching art history. While texts devoted entirely to art history education may be rare, scholarly journals are rich with information. Bite-sized and narrow in scope, these articles are often eclipsed alongside larger features on studio art and production. For interested art history instructors, however, the time spent uncovering these articles reveals a rich literature authored by instructors in art history and art education. A few key individuals seem to generate the majority of the scholarship on the topic of art history education as the same names regularly occur in a bibliographic review, and it is refreshing to note that the majority of these authors are actively involved in the discipline, lending credibility to their recommendations. If these issues were present in a class with 100 students, what of todays lecture halls filled with several hundred students? Would the aforementioned teaching techniques be applicable? How do instructors accommodate student participation, questions, and interaction in a classroom of hundreds? This is but one area where further research and refinement is necessary. It would be helpful to read more articles like Robin Alexander’s “’Mr. Jewel as a Model:’ An Educational Criticism of a High School Art History Class” which bases its findings upon observation of classrooms where these techniques are in use. One area of further inquiry could involve interviewing college art history instructors to gain a perspective into their experiences within the classroom. Through these talks one should be able to identify any disparities between the accepted wisdom and actual experiences which can only be gleaned through years of teaching experience. From these in-depth conversations with instructors, one could create guidelines for “best practices” within art history education on the collegiate level. This could be extended to create a general curriculum, suggest ideas for presenting material that may not be considered the “traditional” ways of presenting art history concepts, as well as develop a sample rubric that takes into account the various facets of learning and understanding within the history of art. The study of the teaching and learning of art historical concepts seems so daunting it is no wonder that instructors revert back to the lecture method of instruction. But is this the best approach to engage students and stimulate learning? The current literature on the topic suggests not. Instead various books and journals propose a host of alternative teaching methods. Further research and investigation is necessary to determine the effectiveness of these methods in increasing the students’ involvement with the subject matter. Still, the research that has been done guides the way toward making art history accessible and meaningful to all students. Whether a student majors in the subject or enrolls in the course to fulfill an elective, the class should be a meaningful experience, engaging students in a useful and relevant study of the history of art. Contextual relations, or the relations of the artist’s choices and outcomes to historical circumstances and to the social, political, and cultural milieu in which a work is produced and for which influences of varying kinds (including other works of art) may be cited (emphasis here will be on how the work functioned in its own time). Investigating works of art to determine their origins, histories, meanings, and influences upon subsequent art and artists. Dobbs, Stephen Mark. Learning In and Through Art. Los Angeles: The Getty Education Institute for the Arts, 1998, pg. 41. McCarthy, Michael J. Introducing Art History: A Guide for Teachers. Ontario: The Ontario Institute for Studies in Education, 1978, pg. 7. Chapman, Laura H. Instant Art Instant Culture: The Unspoken Policy for American Schools. New York: Teachers College Press, 1982, pg. 90. Walley, John E. “Pitfalls of Art Appreciation.” Selected Papers. Chicago: University of Illinois at Chicago Circle (1975): 47-53, pg. 47. Saucy, Don and Nick Webb. “History: Who Cares?” Art Education 37 no. 5 (September 1984): 37-38, pg. 37. Janson, Horst W. “Art Critics, Art Historians and Art Teachers.” Art Journal 32 no. 4 (Summer 1973): 424-425, 428, pg. 425. Mathews, Patricia. “What Matters in Art History.” Art Journal 54 no. 3 (Autumn 1995): 51-54, pg. 52. Hales, Peter Bacon. “Discipline/Survey.” Art Journal 54 no. 3 (Autumn 1995): 65-69, pg. 65. Galbraith, Lynn and Marvin J. Spomer. “Does Art History Go To School?” Art Education 39 no. 5 (September 1986): 10-13, pg. 13. DeLong, Patrick. Art in the Humanities. New Jersey: Prentice-Hall Inc., 1966, pg. 8. Chapman, Instant Art Instant Culture: The Unspoken Policy for American Schools, pg. 76. Galbraith and Spomer, “Does Art History Go To School?,” pg. 13. Alexander, Robin R. “’Mr. Jewel as a Model:’ An Educational Criticism of a High School Art History Class.” Studies in Art Education 21 no. 3 (1980): 20-30, pg. 20. Collins, Howard F. “Art History/High School.” Art Education 16 no. 5 (May 1963): 6-9, pg. 6. Sowell, Joanne E. “A Learning Cycle Approach to Art History in the Classroom.” Art Education 46 no. 2 (March 1993): 19-24, pg. 19. McCarthy, Introducing Art History: A Guide for Teachers, pg. 3. Stinespring, John A. and Brian D. Steele. “Teaching Art History: Getting Started.” Art Education 46 no. 2 (March 1993): 7-13, pg. 7. Graham, Mark Miller. “The Future of Art History and the Undoing of the Survey.” Art Journal 54 no. 3 (Autumn 1995): 30-34, pg. 30. Chalmers, F. Graeme. “Teaching and Studying Art History: Some Anthropological and Sociological Considerations.” Studies in Art Education 20 no. 1 (1978): 18-25, pg. 19. Janson, “Art Critics, Art Historians and Art Teachers,” pg. 428. Freedman, Kerry. “Recent Theoretical Shifts in the Field of Art History and Some Classroom Applications.” Art Education 44 no. 6 (November 1991): 40-45, pg. 42. Chapman, Instant Art Instant Culture: The Unspoken Policy for American Schools, pg. 32. Sowell, “A Learning Cycle Approach to Art History in the Classroom,” pg. 23. Bandura, Albert. “Social Learning Theory Through Imitation.” Nebraska Symposium on Motivation. Vol. 10. Ed. M. R. Jones. Lincoln: University of Nebraska Press, 1962, pg. 215. Alexander, “’Mr. Jewel as a Model:’ An Educational Criticism of a High School Art History Class,” pg. 25. Levi, Albert William and Ralph A. Smith. Art Education: A Critical Necessity. Urbana: University of Illinois Press, 1991, pg. 55. Stinespring and Steele, “Teaching Art History: Getting Started,” pg. 7. Stewart, Marilyn G. Thinking Through Aesthetics. Worcester, MA: Davis Publications Inc., 1997, pg. 50. Graham, “The Future of Art History and the Undoing of the Survey,” pg. 3. Stinespring and Steele, “Teaching Art History: Getting Started,” pg. 11. McCarthy, Introducing Art History: A Guide for Teachers, pg. 9. Levi and Smith, Art Education: A Critical Necessity,pg. 55.